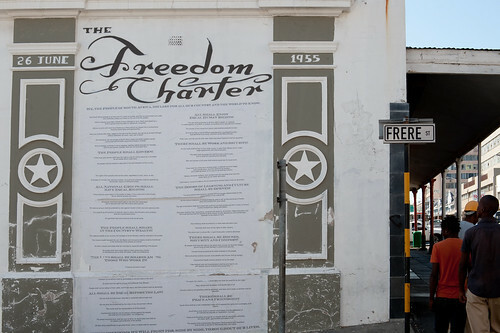 Yesterday, Faith 47 linked to a new video that features a series of her works centred on the Freedom Charter. I think the video might also show her creating the piece that is a sort of hinge in my series Where will I spend my happy days? Anyways, watch the video. It’s beautiful. I love the pacing of the visuals and the music. Then I discovered she has other videos there. 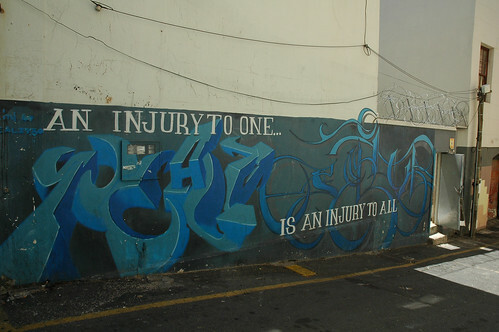 This one is about a piece she did in Woodstock, near Gympie Street, which has a terrible reputation for crime and disorder. I never went down Gympie Street myself, mostly because I just ran out of time. But supposedly when I was there it had been cleaned up, a clean-up that involved removing many of the street’s inhabitants. This video reminds me of Stephen Watson’s quote about how some cities “are clotted with words in the same way that certain landscapes are polluted by filth. 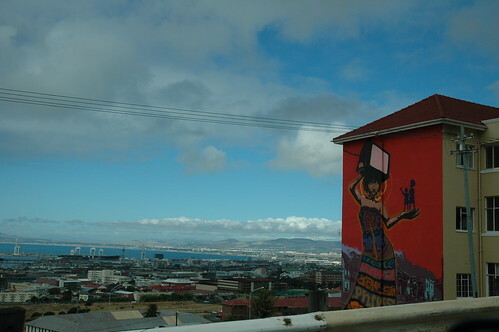 Words proliferate here like layers in a landfill: all psychic space is overpopulated with them.” He was talking about New York City, but as I’ve edited my photos from Cape Town, I’ve often thought it applies there too. Anyways, watch this video too. Stunning work. the cape of good hope from rowan pybus & faith47 on Vimeo. Alec Soth’s publishing venture, Little Brown Mushroom Books, just published a book by Trent Parke. This is Parke’s first book in 10 years and it’s a numbered edition of 1000 for only $18. I waited until after I’d ordered mine, but by that point I figured anyone who would be interested would already know anyways. I adapted this recipe for rhubarb custard crisp on the weekend to include strawberries. I served it with whipped cream, and it was wonderful. All I did was cut the rhubarb to 3 cups and added a generous cup of strawberries, and reduced the sugar to about one a half cups. I will definitely make it again, and it just felt like a public service to share the recipe. But this is a photography-centred blog, not a recipe blog. I also discovered, via Tony Fouhse, this great project of 500 photographers. Pieter Wisse is showcasing 5 photographers per week for 100 weeks, and in most cases he includes video of the photographer speaking or working. In particular, I liked the video he chose of Elinor Carucci (photographer #28) speaking about photographing her children. I think this will be a great resource, and every time I see a photographer whose work I’m already familiar with, I get a little thrill. But then I wondered if perhaps twitter was really a better avenue for this kind of thing. And chances were I was already way late to that party and anyone who would be interested would already know about it. I also started a post about the new campaign the City of Guelph has going on with cheeky road signs and how I’m not convinced the clever, hip tone really suit the body that handles property taxes and maintains essential infrastructure like our water supply and roads. But that sort of brought in discussions about my day job and that’s all new territory here that I wasn’t sure I wanted to explore. So… can you help me out of this quandary a bit? I realize you can’t help me stop second-guessing myself, but maybe you could introduce yourself and let me know what your interests are? As much I created this space for myself and my own interests, I know I have a few regular readers and I kind of want to know who you are and why you come here. So what do you say? Ever since I got back from South Africa, I’ve been feeling pretty dissatisfied with the work I shot there. 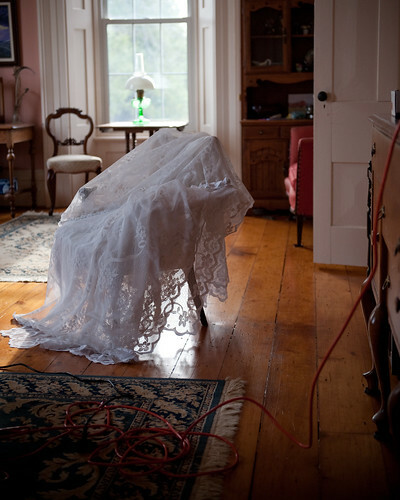 The workshop with Alec Soth unlocked what I think was at the root of that dissatisfaction. So since then, I’ve been working on the images and the edit, and I think I finally have something I’m happy with. So I’ve made a new gallery here. As always, I’d love critique if anyone cares to offer it. This week I also learned that Jodi Bieber has a new book coming out about Soweto. I haven’t pre-ordered yet (I absolutely have to get Mikhael Subotzky’s Beaufort West first), but I’m pretty keen to get my hands on it. Spring cleaning at my parents’ house has a slightly different angle from other houses. Every spring the windows of their house get covered with ladybugs, so they have to vaccuum up the carcasses every day for a couple of weeks in the spring. I made this picture on Easter weekend this year. With South Africa’s World Cup fast approach, there’s been a lot of talk of Africa in the media and on blogs. Just yesterday, I came upon two discussions worth passing on. AFRICA IS A COUNTRY reposted a piece by a London Lara Pawson writer about how Western media talks about Africa. She says, “I have almost reached the stage where I believe that any interest in that huge and complicated continent can only be false and without meaning. Africa has become perhaps a parody of Africa.” I recommend you read the whole thing. Conscientious then pointed me to this post calling for new visual stories of Africa. I think the CONTACT exhibition at Gallery 44 showed contemporary African photography working along similar lines. Unfortunately I didn’t get to see the show… life kept distracting me, but I hope there will be other opportunities down the road.